There’s a feeling of joy that comes from discovering that you can make cleaning and body care products. Making your own products can be expensive, at least in the beginning. One bottle of castile soap can cost anywhere from $8.99 to $18. Dried lavender may cost $10 for 8 ounces, and beeswax may cost $15 for just a few pounds. There’s definitely an up-front investment when it comes to purchasing ingredients to make homemade products; just like there was an up-front investment in stocking a real food pantry. Friend, I have good news! 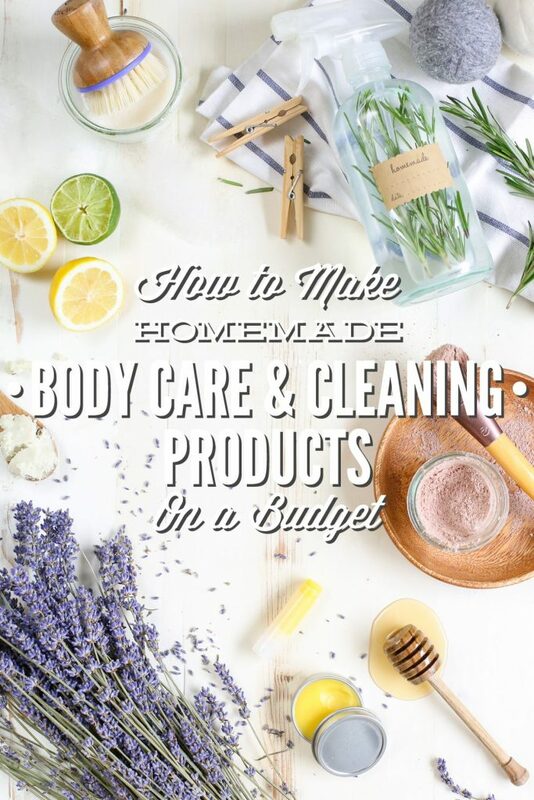 While there’s certainly a cost to making homemade products, you can make natural living work no matter what your budget may be. 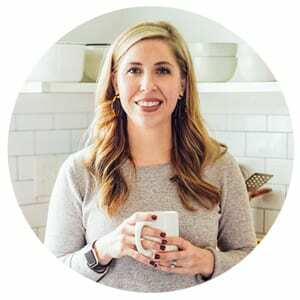 In fact, once you’ve gathered a few basic ingredients (and we’re going to talk about how to do this from a budget-friendly approach), making some or all of your products at home may actually save money in the long-term. Yes, save money. In order to make homemade products fit your budget, and even save you money over the long-term, it’s important be intentional about what you plan to make and where/how you purchase the ingredients. 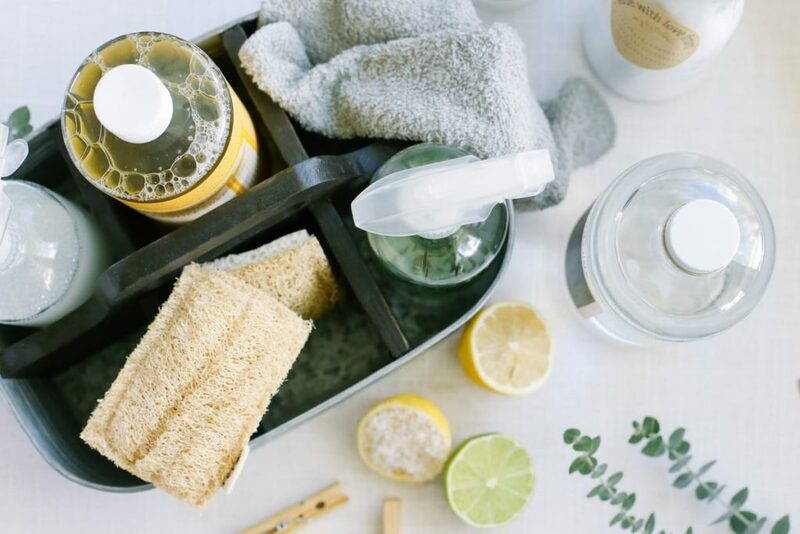 When you first realize that you can actually make cleaners and beauty products at home, it’s easy to want to “do it all.” You may feel the urge to make every single facial scrub, moisturizer, and air freshener recipe, even if you’ve never used these products before. This approach can quickly add up, and may result in making products that you don’t need or use. Here’s my solution: Be intentional and minimalistic. Think about the products that you currently use. What cleaners are you using to clean your home? A floor cleaner, window cleaner, and all-purpose cleaner? Awesome! Focus on making just one product, or two, before you focus on making anything else. Just like ingredients, think about the containers you purchase for making and storing your products. I keep three glass spray bottles on hand for all-purpose cleaner, glass cleaner, and occasionally stain remover. I also keep a few Mason Jars and Weck Jars on hand for both food and homemade products. Just remember, the goal is making products you actually need and use. Be intentional and minimalistic! Once you know exactly which products you’ll be making, and the ingredients and amounts required to make these products, it’s time to search for budget-friendly ways to purchase the ingredients. If you know there’s an ingredient you’ll be using in larger quantities, like castile soap or baking soda, purchase the ingredients in bulk. Dr. Bronner’s sells a gallon-size jug of castile soap. Purchasing the jug versus individual 8-ounce bottles may save a few dollars. Costco sells a huge bag of baking soda. Better Shea sells 16-ounce packages of shea butter (and other do-it-yourself body care products), which is a great price when compared to the small containers sold at health food stores. All of these ingredients may be stored long-term, so it’s safe to purchase them in bulk quantities. Bulk Options: Amazon, Mountain Rose Herbs, Plant Therapy (large bottles of nourishing oils and essential oils), Target, and local health food stores. When it comes to ingredients that you don’t use very often (like dried herbs), or you just may not need very much of due to the quantity called for in recipes, purchase small amounts. This will ensure that you don’t have ingredients just sitting around, which may eventually end up in the trash. My favorite small-quantity resource is the Frontier bulk section in my local health food store. Many health food stores have a Frontier bulk section that features containers filled with loose herbs and spices from Frontier Co-op. If I only need a small amount of chamomile to make lotion bars (a great Christmas gift! ), I’ll visit the Frontier section of the store where I can purchase just a few ounces. Essential oils are all the rage these days, and for good reason. Essential oils are incredibly beneficial when used in cleaning products and on the skin. And while essential oils are incredible, it’s easy to get sucked into the plethora of ideas floating around the internet, and the idea that you need a special kit containing twenty plus essential oils. Friend, essential oils are amazing, and what I’m about to say may not be popular in the natural world, but here it is: Figure out which essential oils you absolutely need, and stick with them. Or, completely skip the essential oils in recipes. I tend to use just a few basic oils: lavender, tea tree, lemon or orange, peppermint, frankincense, eucalyptus, and carrot seed. These oils are used sparingly. I can’t even remember the last time I used eucalyptus essential oil, because I haven’t made a batch of homemade vapor rub in over six months. Being intentional and also frugal with your essential oils (not going through a whole bottle of peppermint oil in a month–unless there’s a reason for this) is important. Also, only purchase essential oils that may be safely reused in multiple ways. If you’d like to cut back on the up-front expense of homemade products, then I recommend skipping the essential oils completely, if possible. 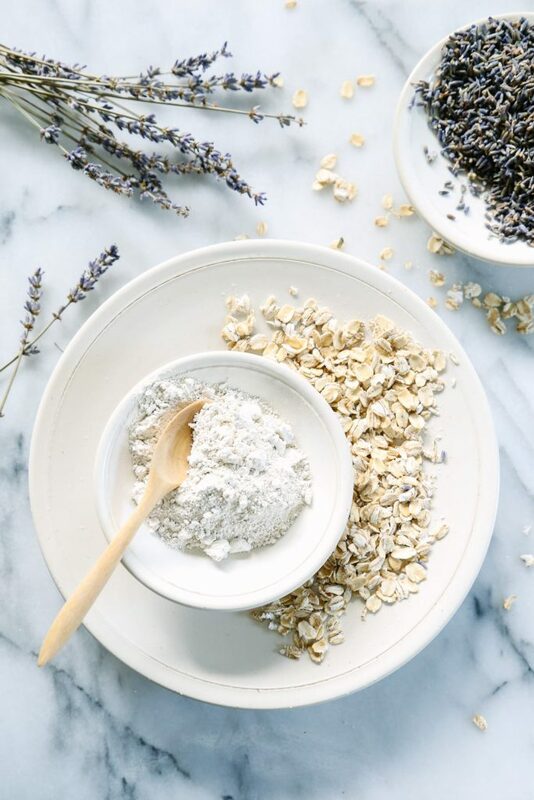 There are a few natural remedies that depend on the use of essential oils for the product to effectively work, like boo-boo cream and homemade vapor rub. 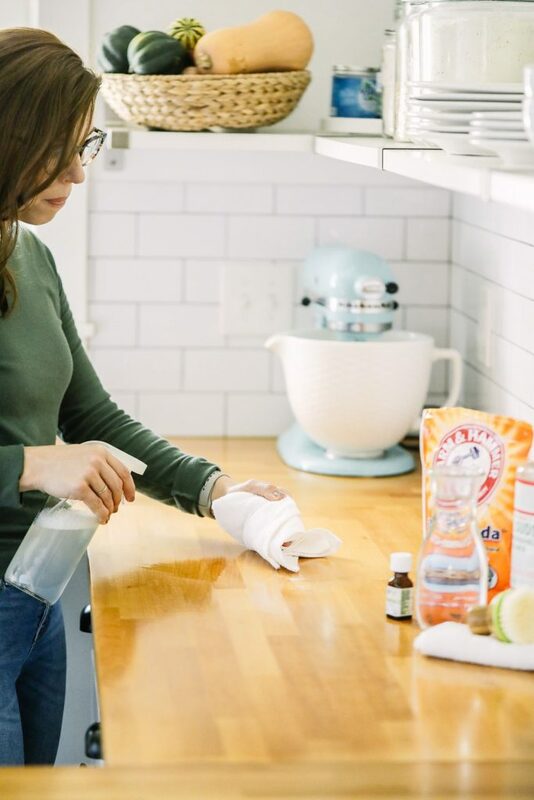 But for 99% of cleaning and body care recipes (homemade air freshener being in the 1%), you can still create an amazing and effective product without the essential oils. Your product may not smell like a lavender field, but you’ll save a few extra dollars. If you’ve been around Live Simply for long, then you know that I’m a big fan of nourishing oils, also known as carrier oils, for the skin. Remember, healthy oil isn’t an enemy; it’s a friend! My favorite oil to use in general is almond oil, mainly because it’s what I have on hand the most often, but also because it’s very light. I usually list a few options in the recipes here on Live Simply. My goal is to help you, the product creator, research and decide which oil you’d like to use on your skin. I personally recommend, from a budget standpoint, sticking with one nourishing oil, and using it throughout all your body care creations. The one exception to this rule is if a recipe calls for a specific oil. 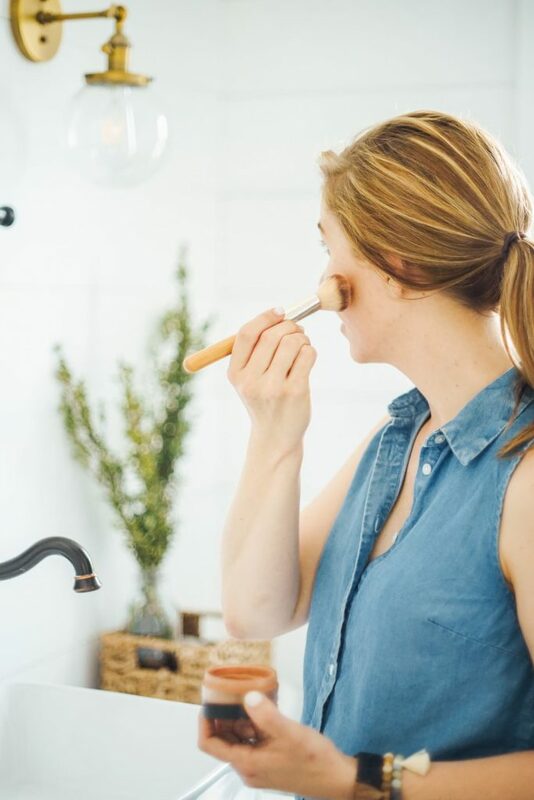 I believe almond oil is a great choice for most people, and it’s not too greasy–a big issue for many folks switching to homemade beauty products. Other options I personally love and use, include: jojoba and olive oil. Hi Kristin, I was just wondering how you and your family did during the storm? I hope everything is okay! Hey Leah, Thank you so much for check on us! That’s so incredibly sweet of you. We live on the West Coast (Tampa Bay), so we got some rain and wind, but that’s about it. We were ready for more–it was a huge storm. Oh, I’m so glad for you! We’re just outside of Jacksonville so were getting pretty nervous. Thankfully it turned just enough to keep most us of safe from major damage just a bunch of junk in our yard and no power for 2 days. I thought of you this morning, I just couldn’t remember quite where you were. So happy you didn’t get hit too hard! Oh wow, I’m so glad you all are safe!! Jacksonville looked like it was going to take a big hit. What a crazy storm. And now I’m so ready for fall ;). Same here, lol. It was so nice today!! I love this sort of thing. Thanks! It seems like every other list of recipes that claims to be simplifying things, is actually complicating things (by sending you searching for some new ingredient or convincing you to make something you had never even thought of before). I’m so glad that you are being realistic and helping people actually keep things simple! Hey Summer, I know what you mean. I think that can make healthy/real food/natural living seem like such a complicated and even elitist lifestyle, too. Hey Tami, I don’t have much experience (or time spent researching) pregnancy and EOs. I found this article from Learning About EOs, which may help answer this question: http://www.learningabouteos.com/index.php/2013/08/06/essential-oil-safety-during-pregnancy/. Lea, the author of Learning About EOs, is a Certified Aromatherapist, so her info is always very well researched and presented. It looks like there are a few oils to avoid, and some precautions to take, while pregnant and nursing. Have you tried homemade shampoo recipes? What did you think of them? I’m concerned my hair would be too oily with homemade shampoos. Hey Janet, I haven’t found any homemade recipes that work with my hair. Right now, I’m using BeautyCounter Shampoo, which is a “more natural” option that many of the soaps sold in the store. It is always hard to get quality body care and cleaning products if you are on a stringent budget. Thes ideas will let me save a lot of money and will save me from certain harmful ingredients present in some products! Thank you for sharing. Absolutely delighted to have found your blog! Trying out a few of your recipes now. I like that you keep it simple, minimalist and straight forward. Hey Charlette, I’m so glad you found Live Simply, too! Welcome!